Limited Dates Available - Booking Fast! If Video Doesn't Load ​CLICK HERE To Open in YOUTUBE. Your Affordable and SAFE Air Duct Cleaning Professionals. Duct Cleaners can be confusing and scary but WE MAKE IT EASY. Most houses have ONE EASY PRICE and we are in and out hassle free. We DO NOT use harsh chemicals of any kind inside your ducts. They can cause rust or allergic reactions to you or your family members and guests in the future. We use no chemicals at all when performing you duct cleaning. ​No Duct Damaging Spinning Brushes. We DO NOT use abrasive spinning brushes. Brushes can wreak havoc on your duct work. 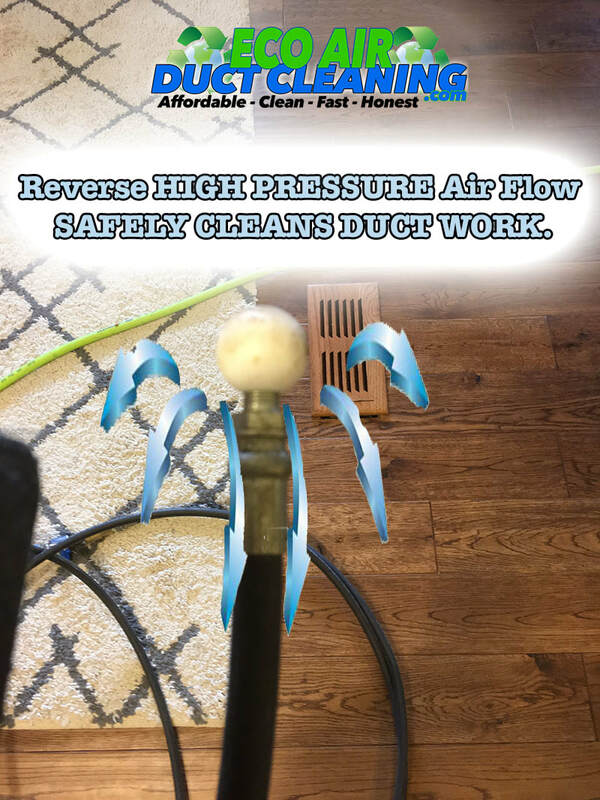 We us 600psi of forced and controlled air and you can actually see the dust, dirt, allergens and grim flying our of your ducts into our closed evacuation system. No chemical can be a permanent answer to keep mold from growing inside of a dark damp place and those chemicals that others use can harm you and your loved ones. That is why we recommend the installation of an in system U.V. light directly above your units coil. This is like putting sunshine inside your system and is your absolute best defense against the dangerous growth of potentially toxic MOLD. Save $50.00 by Ordering In Advance. ​We never give pushy upscales once onsite....we hate people who do that. If you have priced other duct cleaners near me then you know that our duct cleaning prices are super fair and low. Most of our customers use the saved money to install a mold killing U.V. Light and we offer a U.V. Light discount of $50.00 if you pre order it on the phone when you set your appointment. Most homeowners will initially begin researching domestic air duct cleaning services under the assumption that as an important part of the home, they should receive regular service and maintenance. There are those that say this sporadic cleaning is largely unnecessary and can actually be more harm than good. There is some truth to this and poorly equipped and inexperienced service can actually cause indoor air quality conditions. For example the wrong type of vacuum cleaner can actually release more pollutants into the air ducts than had been there originally. 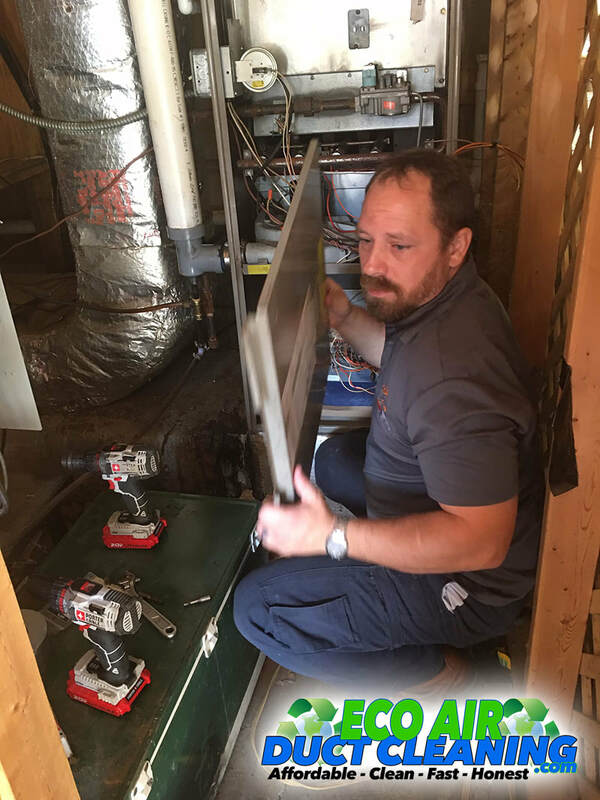 A service person who isn't familiar with the delicate nature of the air duct system can also do damage to the heating and cooling ducts. The results of this can be a heating or cooling system that has to work twice as hard to get half as much done., thus increasing the cost of your energy expenses. The potential benefits and disadvantages of a air duct cleaning are many and varied. It is therefore difficult to make a blanket suggestion for all homes about the urgency of this task. The first step of air duct cleaning should begin with a reputable inspections and cleaning service being called onsite for a revision and quote. If no one in your home has been suffering from any respiratory issues and the inspection service did not produce any harmful allergens or contaminants in your air duct, then there may be no reason to have your ducts cleaned. A presence of musty odors and visible patches of mold growing as well as the presence of large deposits of dust along edges and in vents will invariably call for cleaning services. Nevertheless, if you have members of your family who have begun to feel symptoms of unexplained conditions or begin to develop breathing condition you think could be related to your living environment. Following are the EPAs suggestions for deciding whether or not your home requires an air duct cleaning. 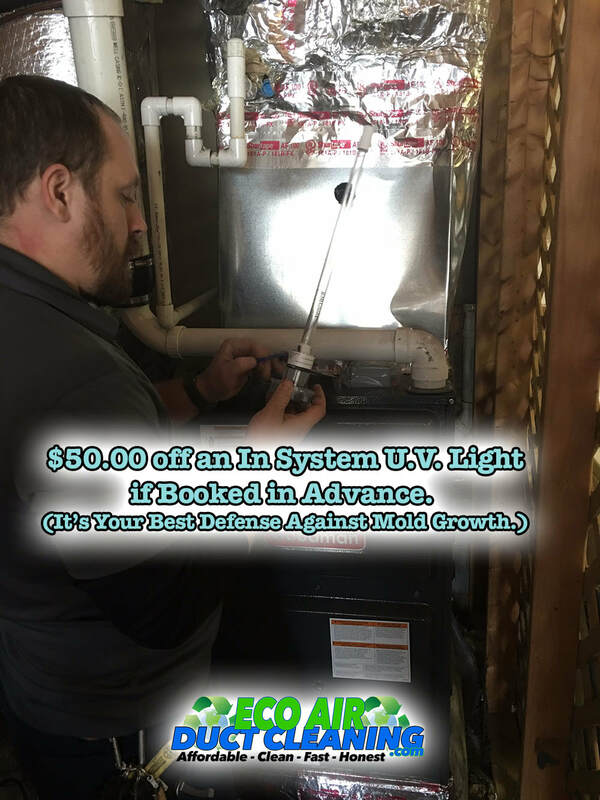 -- There are visible patches of molds growing within your duct system on hard surfaces or metal components of your air ducts of the cooling or heating systems. When looking at these types of systems, there are few major factors to understand. --There are many varied sections and areas of your system. It may be difficult to reach every part of the system with your own. This is where a professional service can be applied to getting the best possible inspection and avoiding many types of hidden contaminants and more. Be sure to ask your inspection service to take samples of the contaminants they find. -- Remember that just because a substance looks like mold it could be many number of things. The only way to be sure would be to get a proper laboratory analysis done to provide a positive confirmation on the nature of the particles. This service will normally run you about $50.00 at your nearest microbiology laboratory. All you will nee is a sticky strip with some of the particles on for a complete identification. -- If you have insulated air ducts and your insulation becomes wet and moldy the materials have become useless. There will be no way to remove this problem without replacing the entire section of insulation materials . --If molds have been discovered in your home’s air ducts, you should know that there is a source of moisture that supports the colony. It will be imperative to remove this source of moisture as this will return en masse. -- Air ducts that have been infested with vermin including birds, vermin and insects. -- Your ducts are continuously filled with excessive amounts of dust and debris and this begins to be released into the living environment through the duct work. -- As yet there have been no studies done that show a dust cleaning in your air ducts can actually prevent any health problems. The same studies have shown that the dust in your home will not necessarily increase with the dust levels in your air ducts or decrease after a cleaning. The main reason for this is that most dust particles are not introduced into the home through the air ducts. The dust within the ducts is dust that has become caught within the system over time and is not necessarily going to be released into the home. Unless it is disturbed by a elemental or biological interference. -- Most pollutants that enter the home do so through the same way you, your fellow residents and house pets do. Activities like cooking, cleaning, smoking as well as outdoor cooking and can introduce much greater quantities of dust into the home then you can expect from your average air ducts. Furthermore, there has been no evidence to date that the conventional quantities of dust that accumulate in the home are any threat to the health. -- The EPA actually recommends that the air ducts be cleaned only on as needed. This is because the cleaning on the air ducts has still not been seen to improve the conditions of the home or affect the health of the occupants. --The recommendation made by the EPA have to do with the more dangerous event of carbon monoxide poisoning. For this reason if your home is equipped with any fuel burning stove, fireplaces or furnaces these should be inspected for functionality and properly serviced. This will ensure that these operate as they should and keep you and all in your home safe from the dangers of asphyxiation. --For those looking to improve the functionality of their cooling and heating systems. The experts recommend cleaning your heating and cooling fans, lades and coils as this is the best way to improve their function. Talk to one of our professionals who can give you an honest opinion. Our sister company can serve all types of and ask them about the services they can offer to improve the function of your homes air ducts.